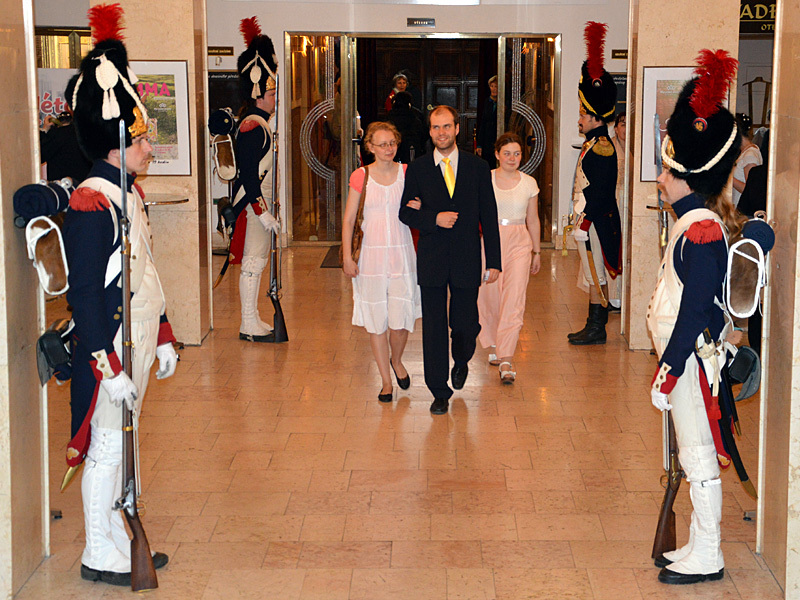 Experience a historical day with us! We would like to invite you to a unique day for all who wish to immerse themselves in Jane Austen's world for a moment: Picnic - Performance - Party, all in period costume, if you wish, in authentic historical surroundings of an empire-style château, Čechy pod Kosířem near Olomouc. 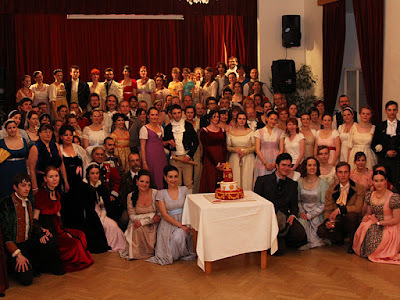 The event is organized by the Jane Austen CZ Society in co-operation with the Čechy pod Kosířem Château, under the patronage of the Governor of the Olomouc Region. 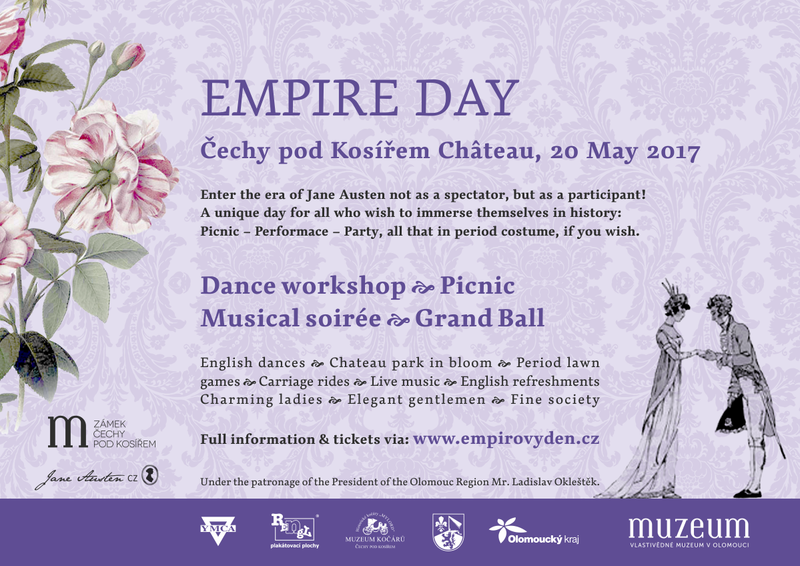 * Day Ticket – a ticket for the whole programme includes: the dance workshop, picnic afternoon, themed programme in the chateau and the Empire Ball. The price is 450 CZK. * VIP Day Ticket. 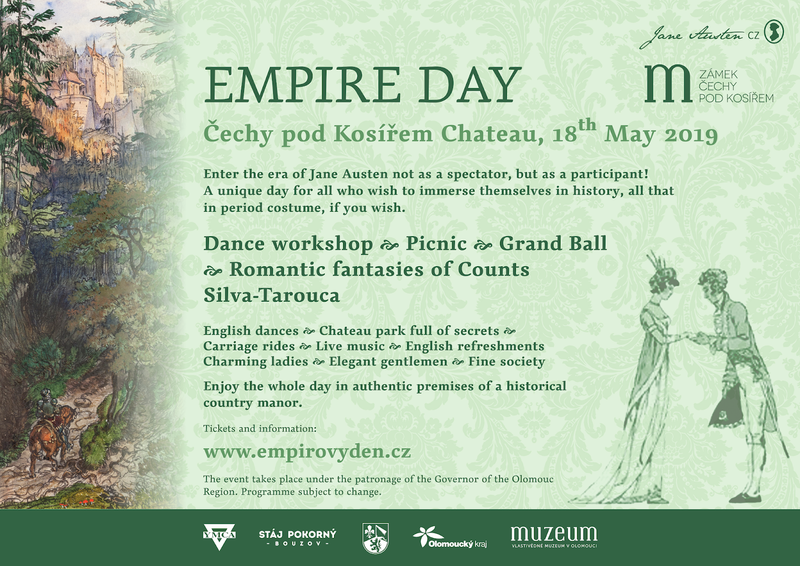 This ticket includes the whole programme as shown above: the dance workshop, picnic afternoon, themed programme in the chateau and the Ball. 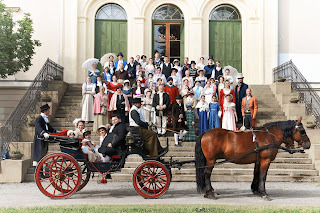 Additionally, VIP ticket holders are entitled to a free carriage ride during the picnic, a photo op in the historic rooms of the chateau, five-o'clock tea, and a glass of sparkling wine at the ball. Price is 590 CZK. 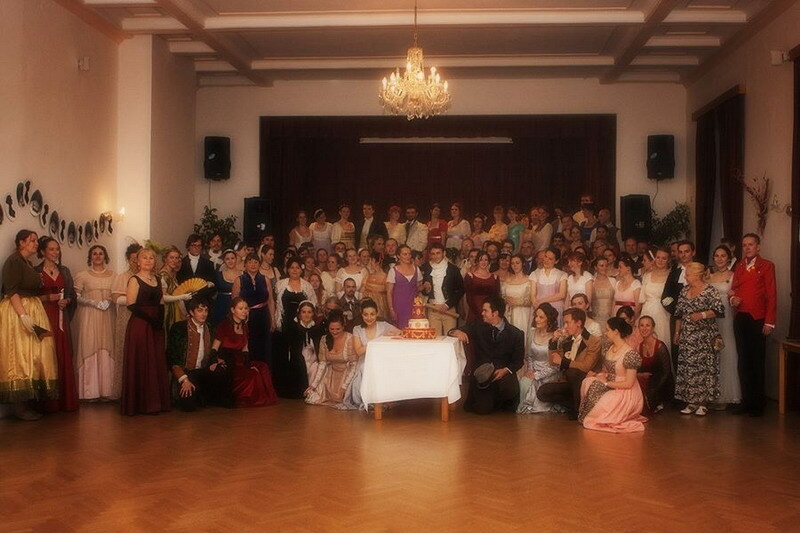 * Evening Ball Ticket: A ticket for those who cannot attend the whole event but wish to be present at the ball. Price is 250 CZK. To receive further information about the event, enter your e-mail here to receive the newsletter. N.B. - If you find the programme attractive but you are unable or unwilling to participate in period dress, please do not be discouraged and come anyway! The whole event is aimed to be a pleasant cultural experience for all those involved. Ladies and Gentlemen, we are looking forward to welcoming you! Participants will learn the basics of English country dances in an informal setting which they can repeat at the evening ball. Comfortable clothing suitable for dancing is sufficient for the workshop. Shoes are best with a flat sole or only a small heel. The dances are simple and require no previous dance training. They mostly use an ordinary walking or skipping step, thus all ages can handle them and even those with no previous dance experience will soon grasp the basic elements. 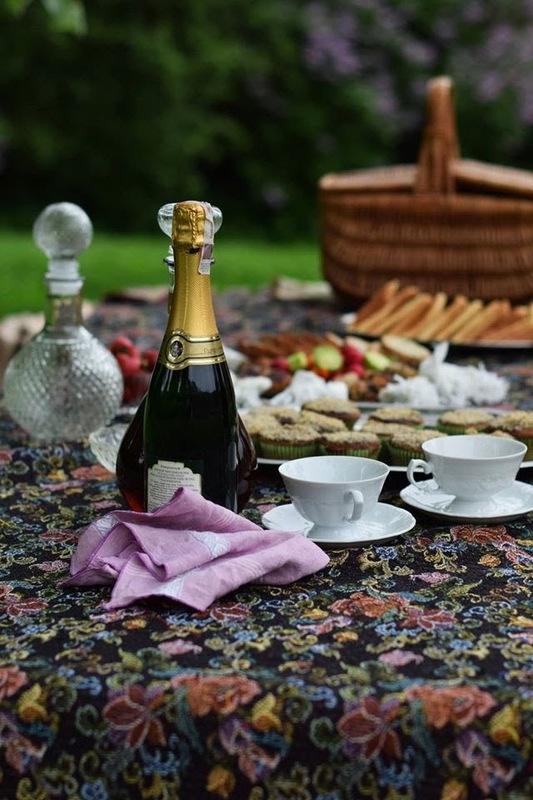 Picnic from your own resources or pre-paid picnic packages picked up on the spot. In case of inclement weather the picnic will take place inside the conservatory. 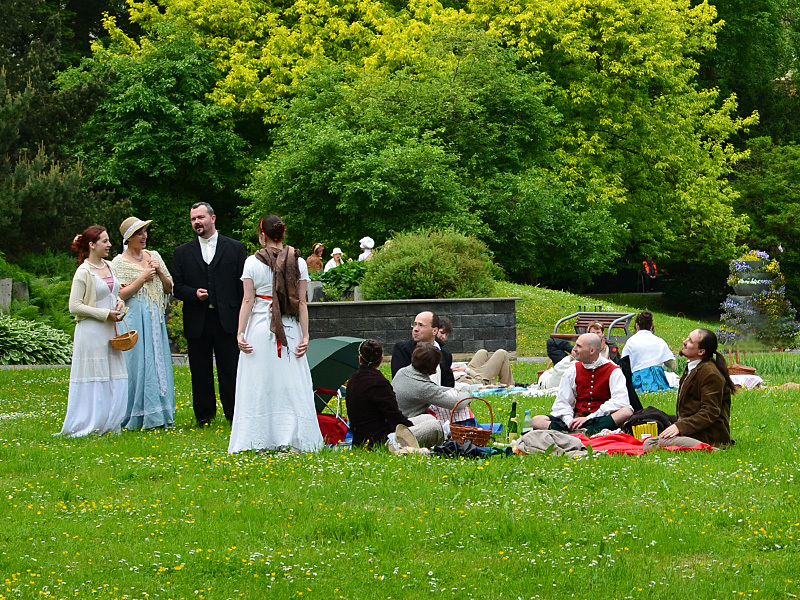 During the afternoon, you can also take a tour of the chateau, take a carriage ride or join period lawn games. To give all participants a moment to sit back and gain strenth for the upcoming dancing, dinner will be served directly at the ball venue. A selection of warm dishes will be available; your chosen meal will be included in your pre-paid ticket. 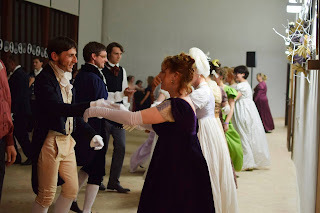 The day will culminate with a grand Ball, where all the day’s participants will meet and experience the wonderful atmosphere of the Regency period, when the broad strata of society of the picturesque English countryside used to meet on the dance floor. 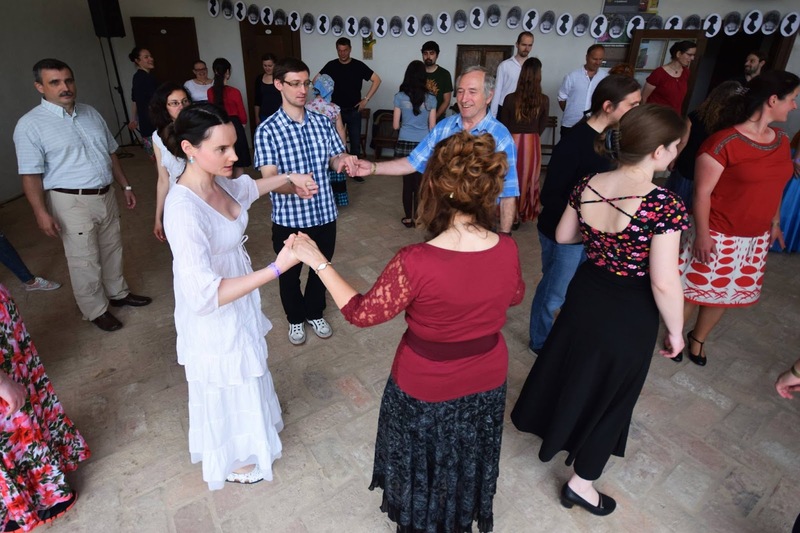 Each dance will first be taught using explanation / repetition, and the dances will also be “called” while in progress. All the dances are relatively simple and are therefore manageable even if you didn’t attend the morning dance workshop. 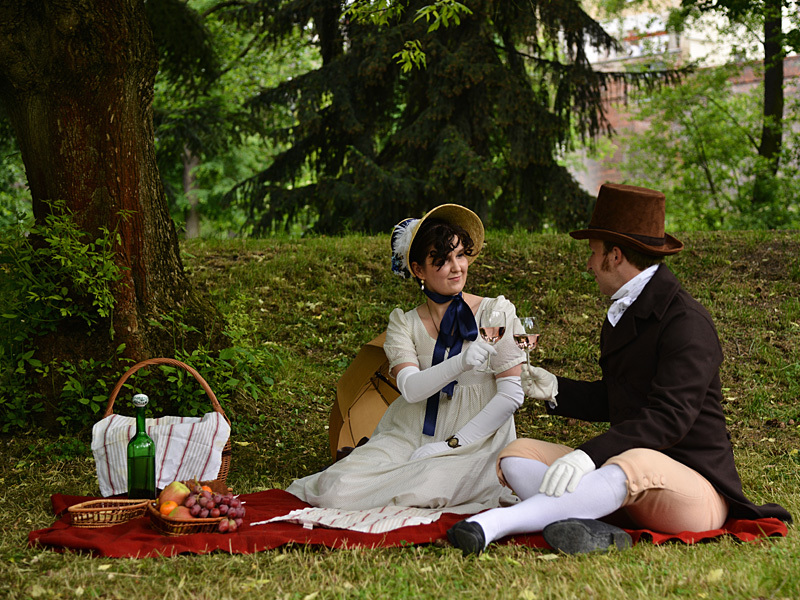 If you decide to travel in time on this day of experiences, period attire will undoubtedly help you to feel in place. Here is some brief information about the style of the period in which you will find yourself or you can look at the photos in our PHOTOGALLERY. You can find inspiration for your costume for example in the gallery of Jane Austen CZ events. 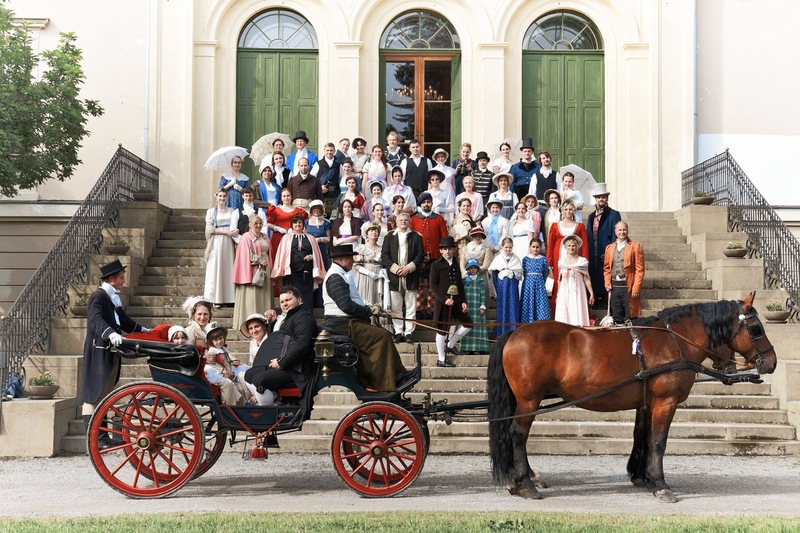 Please note: If you find the programme attractive but you are unable or unwilling to participate in period dress, please do not be discouraged and come anyway! The whole event is aimed to be a pleasant cultural experience for all those involved. The chateau is located 70 km from Brno and 22 km from Olomouc, about 20 minutes drive from the exit of the motorway D46. 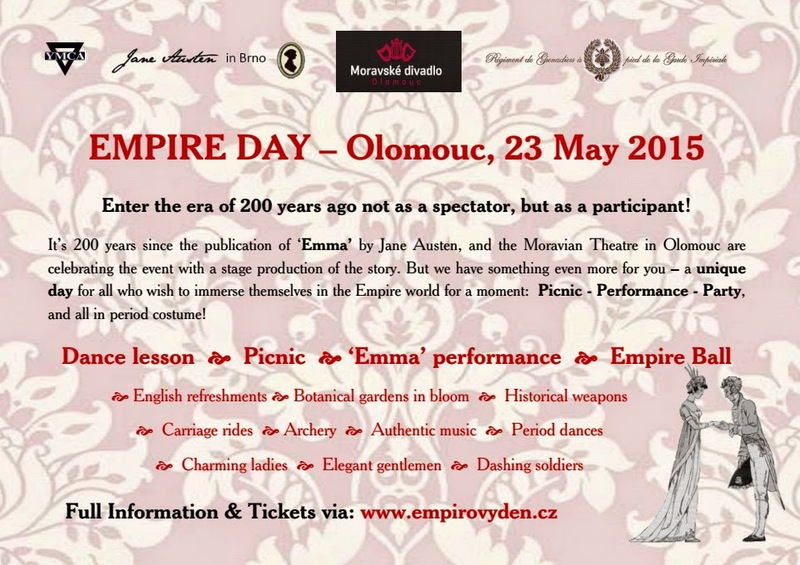 You can of course also get there by public transport – by coach from Brno, Prostějov and Olomouc. If you travel by car, you can use a large parking area near the chateau. 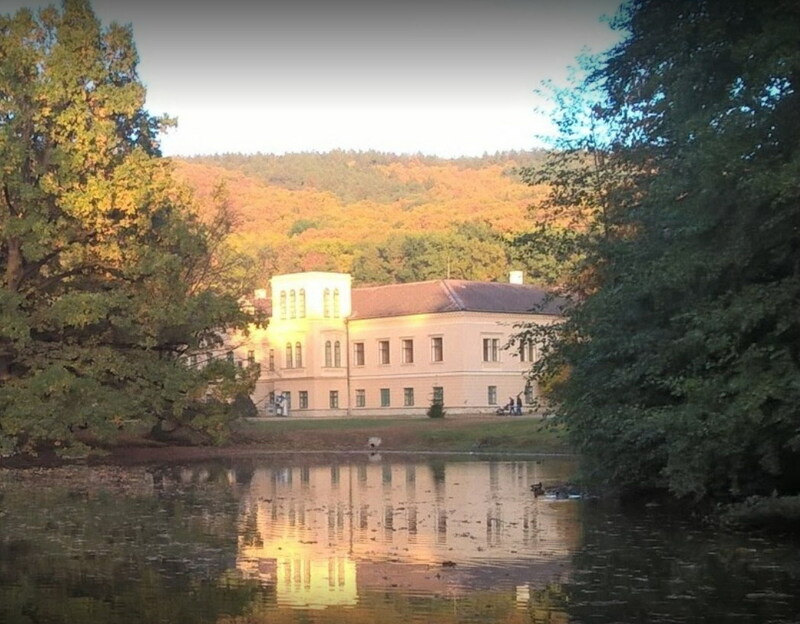 We have identified the following options for budget accommodation for participants from outside Olomouc. You can book at your own discretion for one or two nights. All are located ca. 5-10 minutes walk from the venue, so it should be possible to get there during the day to change, drop off your picnic basket etc. A new sports hall with facilities; lodging in your own sleeping bag + mat, 50, - CZK/pp/night. Reservations through the main booking form. Six en-suite rooms and a larger dormitory rooms. A nearby spa with several kinds of accommodation. 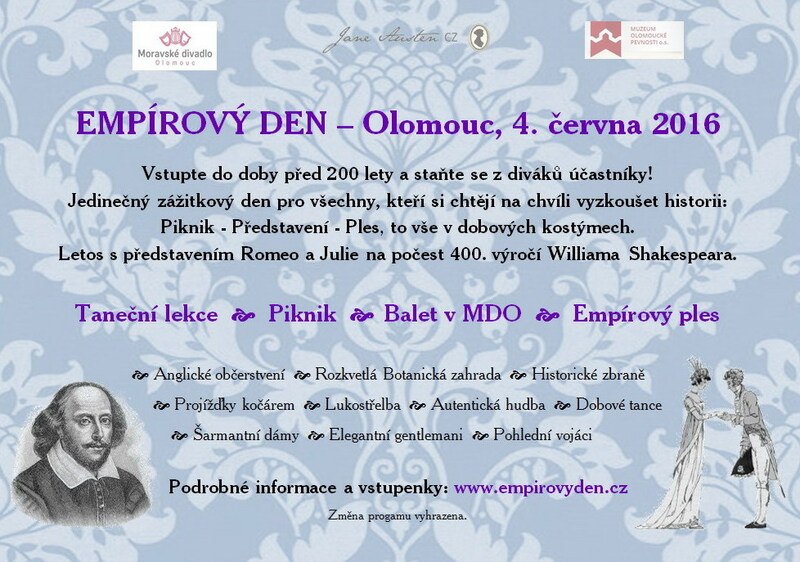 More upscale accommodation is of course available in Prostějov and Olomouc. While looking forward to the next one, you can enjoy the PHOTOGALLERY from the first and second Empire Days in blossoming Olomouc or from last year's edition in Čechy pod Kosířem. Nearest 'English' events can be found on the website of the organiser, Jane Austen CZ. We are looking forward to making your acquaintance!